Seasonal spiced cakes with an apricot fruit filling, covered in dark chocolate. Made in Germany to a traditional recipe. Soft and mildly spiced, with apricot fruit filling and covered with dark chocolate. 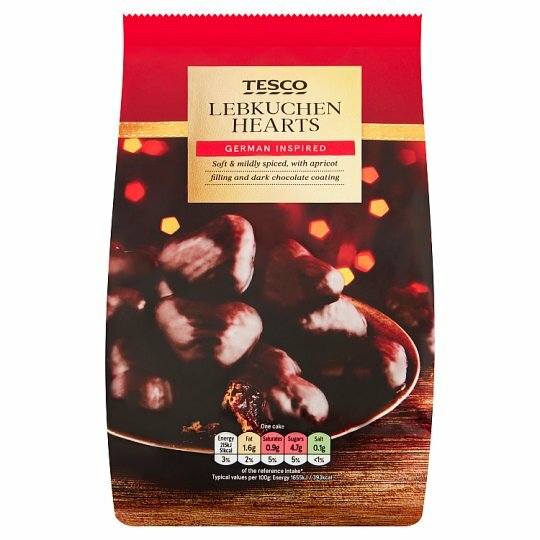 INGREDIENTS: Wheat Flour, Dark Chocolate (25%) [Cocoa Mass, Sugar, Cocoa Butter, Whey Powder (Milk), Emulsifier (Sunflower Lecithins), Flavouring], Invert Sugar Syrup, Sugar, Apple Pulp, Apricot Concentrate (3.5%), Caramelised Sugar Syrup, Raising Agents [Ammonium Carbonates, Potassium Carbonates, Sodium Carbonates], Stabiliser (Sorbitol Syrup), Palm Oil, Spices [Cinnamon, Anise, Clove, Ginger, Coriander], Acidity Regulator (Citric Acid), Flavouring (Milk), Gelling Agent (Pectin), Coconut Oil, Emulsifier (Soya Lecithins), Dried Egg.